Hanoi (VNA) – The Health Ministry will intensify the spraying of mosquito-killing chemicals in high-risk areas as the dengue fever epidemic shows signs of worsening, especially in Hanoi. At a meeting on combating dengue fever in Hanoi on August 10, Director of the Preventive Medicine Department Tran Dac Phu reported that 80,555 cases of dengue fever had been reported in the country so far this year with 24 deaths. More cases are expected as it is now the peak of the disease season. Health Minister Nguyen Thi Kim Tien expressed concerns at the rising trend of dengue fever in Hanoi despite drastic efforts made by the health sector. Hanoi ranks second after Ho Chi Minh City in the number of dengue patients with 13,900 cases as of August 9. The Preventive Medicine Department stressed that the main cause of the spread of dengue fever is the early arrival of summer this year with higher temperature and rainfalls than in previous years. The awareness about disease prevention among population and authorities is low due to the absence of the epidemic for years. The department has set up three mobile taskforces to deal with the dengue epidemic. 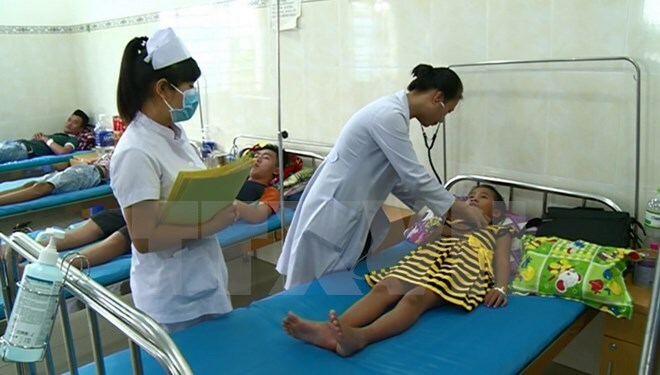 The Health Ministry will send experts from the Central to help four Hanoi districts hardest hit by the epidemic and dispatch six teams to inspect anti-epidemic work in eight hot-bed provinces.